Diamond Microdermabrasion can treat: aging and sun-damaged skin, some types of acne scarring and acne, altered pigmentation, stretch marks, fine lines, enlarged and clogged pores. With the flexibility of using different suction levels, it also increases blood flow to the skin, and that in turn helps to produce collagen. As we age the skin cell turnover slows down and the skin starts to look dull and lack luster compared to having that youthful glow. 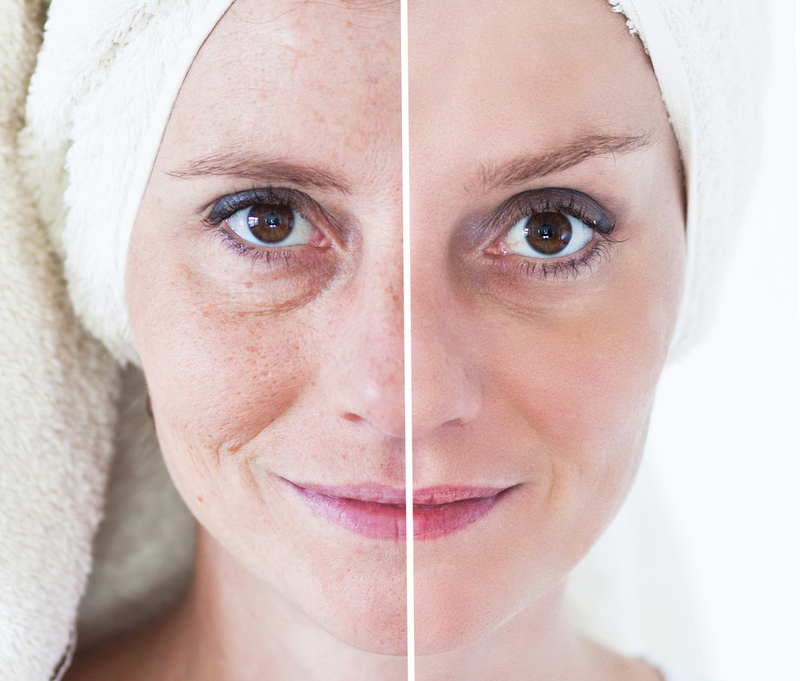 As we age there is also pigmentation or age spots that flaw the skin. Blocked pores give rise to black heads and acne. Chemical peels rejuvenate the skin and leave your complexion luminous. A peel is a perfect treatment to have to help kick-start rejuvenation in your skin. It is also used for pigmentation and to unblock pores, reduce sebum production and acne break outs. This unique all seasons treatment features a blend of vitamin c, mandelic acid and mastiha. This beautifully brightening formula is perfect for first time clients or clients who want instant no-down time results. This treatment is an exclusive Lira Clinical procedure. Lactic acid blended with an organic melanin suppressant, hyaluronic acid, green tea and echinacea, this is the peel of choice for pigmented, sun-damaged and dehydrated skin. Infused with antioxidants, skin will look and feel refreshed. This ultra – resurfacing blend of glycolic acid and retinol visibly reduce the appearance of fine lines and wrinkles leaving skin firm and revitalized. Restore and soothe while gently lightening and exfoliating superficial skin layers. This anti-aging alpha-hydroxy blended peel rebuilds skin with doses of retinol for maximum resurfacing results. Uniquely formulated pumpkin enzymes are infused with retinol while super-rich pomegranate and mango antioxidants fight free radical invasion. The versatile pulp delivery system found in this treatment makes it ideal for any skin type. Azelaic Acid is naturally antibacterial which makes it a great treatment for acne. When applied topically, it reduces the growth of bacteria in a follicle, helps to reduce inflammation and remove dead skin cells to prevent future acne breakouts. Azelaic Acid can be used on just about any skin type, including sensitive skin, as it has the ability to reduce inflammation. Anyone with rosacea, especially those with acne rosacea, will find it makes an excellent treatment for calming and soothing their inflamed skin. Herbal Peeling Treatment which helps people with various skin problems to get a clean and even skin. The basis is a mixture of eight selected herbs containing enzymes, minerals and vitamins, which are massaged into the skin. It is two-phase lifting program, stimulates regeneration of the skin. It is based on the innovative use of glycerinic acid, which delays the aging process of the skin. It inhibits the action of hyaluronidase, an enzyme that breaks dawn natural hyaluronic acid in the skin.